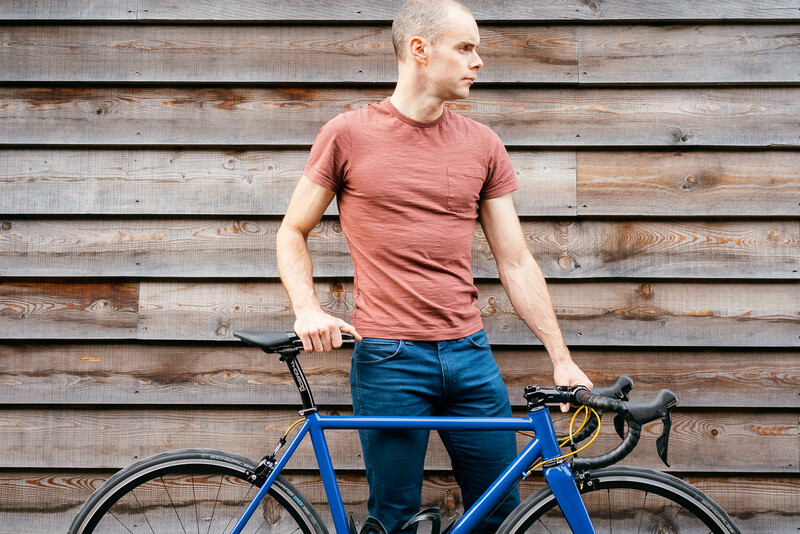 I wanted a fast, beautiful and well-made steel road racing bike. The story below is how I came to be a proud owner of a Mercredi. I met Adeline through friends from a cycle team and later learnt about her making frames. After seeing some of the CX frames and bikes she had produced, I knew I wanted Adeline to make my next bike. The quality of her previous work was plain to see. This was confirmed when Mercredi won some prestigious rosettes from Chris King and Columbus Tubing at the Bespoked Bicycle Show 2017. The process started with a jig fit to get the frame size, geometry and position right for me. I ride in a fairly aggressive position and the finished bike looks all the better for it. The design is a collaborative process. I have been riding for years and over that time, I have amassed a few little design points I like and dislike. For instance, the positioning of the cable stop for the rear brake has to be tucked away under the top tube otherwise my knee catches it when I stand. However, apart from a few requests, I left everything else in Adeline’s hands. As the build progressed I got the opportunity to visit the Mercredi workshop and it’s everything you would hope for. It smells of machine oil and has that energy a room possesses when quality metal things are made in them… like you would imagine the Supermarine Spitfire factory in Castle Bromwich or Fred Dibnah’s garage might have smelt. Component-wise, I went for what I consider to be quality components that are not too extravagant. Shimano Ultegra drivetrain with rotor cranks, Absolute Black chainrings, Thomson stem and seatpost, TRP brakes and Cats Whiskers Wheels 30mm alloy clinchers wheelset… oh, and gold cables, skewers and bottle cage bolts for a splash of eye-catching colour. Adeline and I went through a few options for colours and finally decided on blue and blue! Cole Coatings Workshop sourced and painted the frame a Cobalt blue that is so rich and deep. The Mercredi decals are also in blue but a few shades lighter and are very subtle. Adeline designed a custom ‘good vibes only’ logo for the seat tube that incorporates a cat’s face and tips a hat to my love of all the members of the feline race. All decals are painted. No stickers here! I picked the frame up myself from Cole Coatings Workshop and these guys know their stuff: the paint and clear coat finish is a super high-shine and incredibly deep. I set aside a whole day to build up the bike. It doesn’t take that long but I really wanted to cherish the build. I find building up a bike helps connect you to it and you get a feel for the quality of the finish and frame. It came together perfectly, in part because Adeline and I had preempted any compatibility and component issues. I think there is a tendency in bike reviews to repeat clichés and phrases, ‘laterally stiff but vertically compliant’ etc. I’ll try to avoid those but I will say it is a beautiful bike to ride. After a very short ride out to get familiar with it, I felt at home and comfortable. I made a few tweaks to saddle and shifter position but nothing much else apart from that. It feels fast and responsive but never harsh. It also handles really accurately and feels nimble. It was at the end of the Redbull 25hr Timelapse event that it was clear the fit was perfect. Apart from tired legs I had no niggles or aches after riding hundreds of kilometers through the night. Having a bike made for me by someone I have met and know makes the way I have bought every other bike seem unfeeling and remote. Before buying a bike I haven’t asked myself this before but I will from now on… Who built your bike?